This is identical wire to Gepco VSD2001. We are changing over to Clark Wire but still have a small amount of VSD2001 in stock which we may substitute. This is our custom-built HD SDI/Digital/Video/Clock 75ohm coaxial cable. 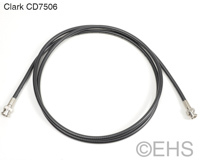 Construction is BNC, RCA or F-Type with Clark Wire CD7506 RG-6 style cable. Clark Wire is very high quality wire, used in the best studios for it's ultimate qualities and durability. Clark Wire CD7506 cable is moderately stiff, durable, medium-weight cable, with 18awg solid center conductor and dual shielded with 95% braided and 100% foil. Clark Wire CD7506 supports 4.5GHz - 4.5Gb/s bandwidth for uncompressed HDTV transmission. Fully supports SMPTE 424M 3G-SDI, SMPTE 372M Dual Link HD-SDI (2 required), SMPTE 292M HD-SDI, SMPTE 344M ED-SDI, SMPTE 259M SD-SDI, Analog video, Digital audio AES3id or SPDIF, word clock, and more. By specification SDI, HD-SDI, SPDIF, Component (RGB and Y/Pb/Pr), Composite video and Clock all have the same wire requirement of 75ohm coaxial cable, so this fits the needs for all digital audio, video and Clock. Typically SPDIF uses RCAs, SDI and Clock uses BNCs, and Video uses both BNCs and RCAs.